1. What is your experience and training background? Be smart when choosing your artist! Makeup artist that have gone through school or training understand the harm of transmitting germs and bacteria through makeup and will be extra sanitary when applying makeup products. They will also be more diverse in different types of makeup, skin tones and overall a more trusted artist. Look for an artist with a license in esthetics/cosmetology or who has completed a master makeup artist program. 2. 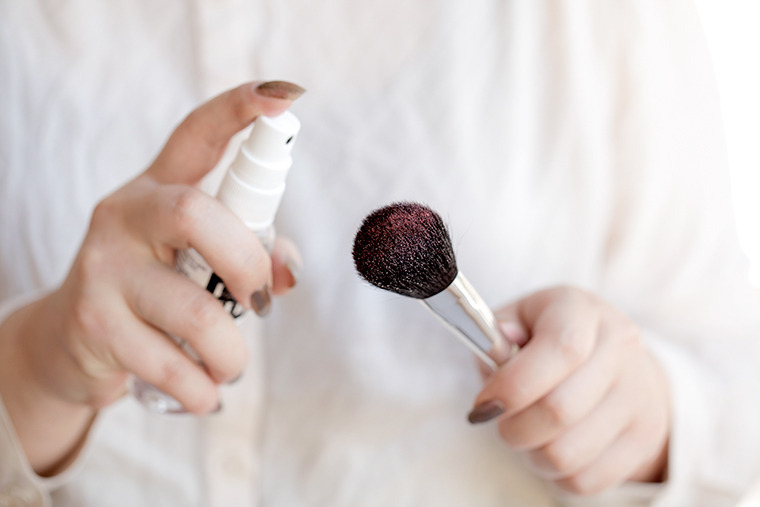 How do you sanitize your makeup brushes and products? An artist that only uses alcohol or brush cleaner on a daily basis isn't good enough. Brushes will collect bacteria and skin cells from every face they touch. Your makeup artist should be shampooing their brushes everyday after each makeup job. Makeup products should never be double dipped or shared, your makeup artist should be using a palette knife to scrape out creams and disposable wands for every layer of mascara. 3. How many years have you been doing bridal makeup? It is important to ask how long they have been working with brides since brides are very different than working with models/actors. Normally models/actors do not have a say in how they are going to look. An experienced bridal makeup artist will be a good listener in order to understand how create a look that best fits the brides needs. Also, weddings are stressful and you will want an artist that is familiar with timelines and knows how to handle any situation. 4. How much time do you need for each person on the wedding day? A good indicator of an inexperienced makeup artist is if they are slow at doing makeup. On average a full bridal makeup application should take 30-45 minutes. Anything longer than an hour for makeup is too slow and and you may want to look for a different artist. Ask your artist how long each application will take before booking them. 5. Are there any extra fees for travel? Most bridal makeup artists will have a standard price for their location or town/city. If they have to commute more than an hour expect travel fees to be applied. If you are doing a destination wedding expect to pay for air travel, hotel and car rentals. Ask your artist if your wedding venue is within their location range and/or if they are willing to travel with expenses paid. 6. What if I cry during my wedding? Will my makeup run? Most bridal makeup artist are wise enough to know to use waterproof everything on a bride and her party. However it is important to learn how to cry when wearing makeup: Make sure to blot the corners of your eyes with a tissue, never wipe. Taking a deep breath through your nose will help clear your tear ducts. Ask your artist if they will use waterproof mascara and liner for your wedding day makeup. 7. What if my lipstick wears off through the day? Check with your makeup artist to see if they will gift the bride a lipstick for her clutch to touch up with throughout the day. Or ask if your artist if they can use a long-lasting liquid lipstick or stain that will need miminal touch-ups the entire day. Yes these products do exist check out my other blog on liquid lipsticks! Some makeup artist are also available for a day rate on your wedding so you can have them handy for touch ups. 8. How soon do I need to book services? A good makeup artist will book up fast so you want to put a hold date as soon as possible. One year in advance is average to hold down a wedding date for a makeup artist. Makeup trials usually take place 6-8 weeks prior to wedding date so make sure you also lock in your trial date too.